As far as international alliances go, Hamilton and Washington leaned more towards England—despite their pickle with the whole American Revolution and all. They viewed their relationship with England in a very pragmatic way. After all, they shared history, language, tradition, commercial needs etc. and Washington believed they were meant to be allies. Jefferson and Madison hated this (obviously), and kept bashing Washington and Hamilton behind their backs in their stupid Gazette. It was around this time that Washington’s first term was coming to an end. He was pretty sick of being president. But once again, he was the only one who could keep the American people united. Without him, the Republicans and Federalists would tear each other to shreds. THAT is probably the only thing that Jefferson and Hamilton agreed on, and they both begged Washington to run for president a second time. He did, and won unanimously yet again. It seems like fatherly love goes well beyond any party‑related disagreements. Or perhaps not so much, because on this second term, Washington was much more openly criticized by the people. Most of the criticism, was about his position regarding the French Revolution, and things started getting more complicated once France declared war against Prussia, Austria, Holland AND England. These Frenchies were on a mission! But Washington didn’t want any part on that mission, he demanded a “strict neutrality” in his Neutrality Proclamation—a document that had Hamilton’s fingerprints all over it. Some people accused Washington (and Hamilton) of being hypocritical since the French had helped them so much during the American Revolution. Which was (kind of) a silly thing to say since it was the French King the one who helped them, not this “new” French Nation who just so happened to decapitate the King. 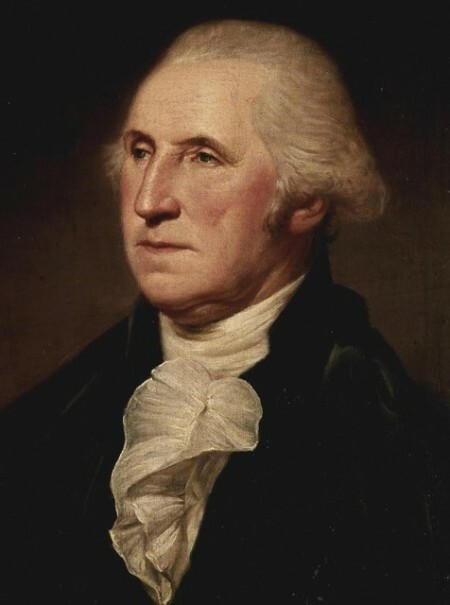 It was a touchy subject but Washington made his position very clear when he said that “nations are driven by their interests not their emotions”, and if the French had helped back then, it was because it was on their best interest for the British to lose that war, not necessarily because they wanted to free the American people. This neutrality of course polarized the United States even more, and to make matters worse, the French minister in the US started conspiring with some Republicans in order to drive the US into a war with England. The whole nation was a ticking political bomb. But then, a miracle happened… Yellow fever… As vice‑president Adams put it, “nothing but the yellow fever… could have saved the United States from a total revolution of government”. One hundred people dying per day! Puking black fluids and bleeding out of every hole. Philadelphia (the temporary Capital) lost one tenth of its population, and most survivors left the city. The streets were deserted and the smell of death was everywhere. Carts patrolled the empty streets with a sign that said “Bring out your dead”, onto which people piled their deceased family members so they could be taken out of the city for a proper burial. Even Hamilton got it, but lived to tell the tale. Phew! 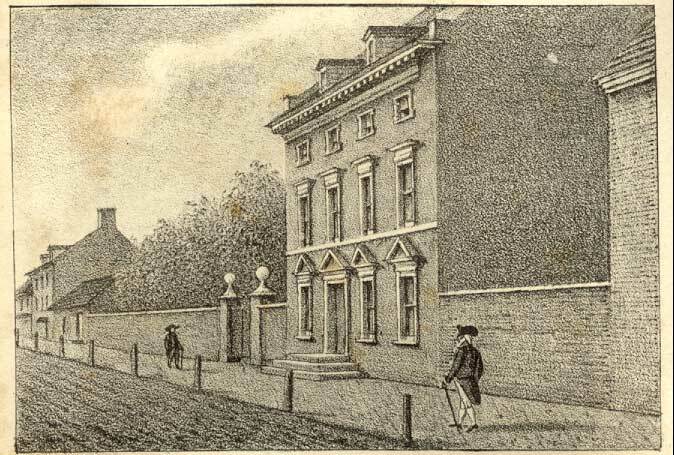 The President’s house in Philadelphia showing desolated streets. They even had to have their cabinet meetings outside the city. Another situation that could have been linked to French influence in the Republican party was the so‑called Whiskey Rebellion. It appears some Republican‑oriented people started planting seeds of hate in the Pennsylvania Whiskey makers in order to cause a revolt. It almost became an international issue, since some people were getting bribed for steering this hatred in favor of French interests, but in the end it stayed local. This was something that touched Hamilton very close to his heart because he was the one who issued the Whiskey tax, and being the go‑getter that he was, he immediately got Washington and Knox (the Secretary of War) brainstorming about a solution. They put together a 13,000 men militia within a couple of days. Washington even put on his wartime uniform and became the first and only president to supervise troops. As far as Knox goes, he made up an excuse about wanting to decorate his house and took a vacation right after the militia was put together2. As silly as that sounds, it benefited Hamilton immensely, he became the temporary Secretary of War and gained full control of the situation. Washington wanted to resolve matters peacefully, but Hamilton knew this called for a strong hand. And he was right. After some negotiation attempts, it became very clear that military action was required, and they rode off towards Pennsylvania with Hamilton leading the Army despite his wife going through a difficult pregnancy and having a sick child3. With this, once again, Hamilton was riding beside his mentor with an army behind them, but this time it was Hamilton who kindled the spirit. He was the one calling the shots while Washington stood silently behind him (probably very proud of his protégé). 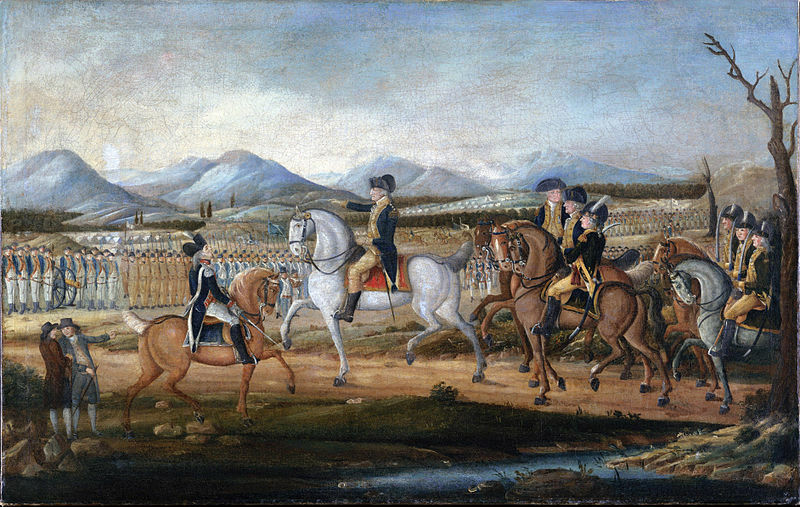 This painting depicts George Washington and his troops near Fort Cumberland, Maryland, before their march to suppress the Whiskey Rebellion in western Pennsylvania. The painting does depict Washington as the main guy, but judging by the letters and narrations in the book, Hamilton was “the Hercules in the field” this time around. The whole thing was politically risky, this huge army could be seen as oppressive, and dangerously close to monarchical tendencies. Nonetheless Washington took the gamble, and the outcome was greatly in his favor. As the large army rode towards the little town where the rebellion was happening, the rebel leaders announced their surrender—even before Washington made it there. A hundred and fifty people went to jail and the leaders were sentenced to death. But in a magnificent touch of constitutional implementation, the magnanimous Washington issued a presidential pardon for them. Then, the unexpected happened…Hamilton resigned! Yes, sad, I know. But his wife had a miscarriage and I guess they decided he had sacrificed enough for his (adoptive) country. Washington no longer had his most piercing weapon. Knox quit too! Although this one was somewhat understandable since Knox missed the Whiskey rebellion, and since then, Washington gave him one of those deadly science treatments only Washington knew how to deliver. I guess Knox got demoralized and quit—or maybe he just wanted to spend full‑time decorating his house... I don’t know. But the cherry on top of this sundae of bad news was “The Jay Treaty”. Remember John Jay? The brilliant statesman who came up with the three branches of government? Well, he was sent to England in order to to come up with a treaty aimed to ameliorate the US/British tension raised by the French Revolution. And he came back with a treaty that heavily favored the English, giving the Republicans a pretty good anchor for their fierce opposition. 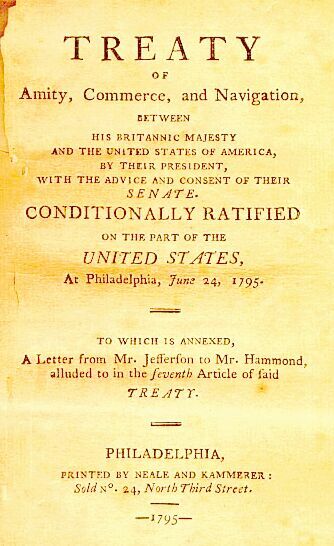 The pamphlet containing the Jay Treaty. Published in Philadelphia in 1795. However controversial the Jay treaty was, it managed to address the main issue: the fact that the British were seizing American ships suspected of sending stuff to France (sometimes without real proof). The treaty stopped this practice, but in turn it favored British imports (something the British didn’t reciprocate), as well as other sacrifices that the Republicans obviously disagreed with. Either way Washington considered this was the best possible agreement in order to prevent a war with England. As expected, it raised a lot of anger among those Americans who leaned more towards France—as well as anger within France itself—and essentially launched the US into a “quasi‑war” with France (as Adams called it). The Jay treaty definitely stripped Washington of any immunity he had from the public opinion. They now were directly and personally attacking him. Accusing him of betraying the Revolution. Yes, Washington… a traitor to the Revolution, of all people! The most penetrating attacks (obviously) came from the Jeffersonians who were mostly responsible for the decrepit look Washington had towards the end of his second term. And although legally he could have ran another time4, there was no way he could have done it. A very tired‑looking Washington towards the end of his second term. Painting by Rembrandt Peale. Washington wrapped it up with a magnificent farewell address, drafted by Hamilton, which could be read (either) as a very inspiring and enlightening piece of advice towards Americans, claiming unity and prosperity—OR if you looked closely, as a document filled with anti‑Jeffersonian subliminal messages. Nobody could really point out the condescending tone towards the Republicans, but it was definitely there—tangled behind words of wisdom and transcendence. As you may know, Adams was elected next, with Jefferson as a vice‑president5. On their inauguration day (the last day Washington spent in Philadelphia), Washington handed off the baton, and thousands of people gathered to say goodbye to the father of their country. When he was finally leaving, he got in his carriage (surrounded by applause and tears), and drove a few hundred yards only to look back and realize hundreds of people were still following him. He raised his hand one more time, and burst of applause roared at their first president for the last time. Back at Mount Vernon, the last twenty years seemed like a dream. George and Martha still had visitors constantly, but not as much as they did after the war. Washington confessed one day that: it had been more than twenty years since him and Martha were able to have dinner by themselves. I think that speaks tons about the kind of lifestyle which they had been prisoners since he rode off for the first Continental Congress back in 1774. But now he was 66, he was back in his plantation, and he was there to stay. Mount vernon was like that old dog that you know is going to die soon but you still want to give it a good life until the very end. America on the other hand was like the college graduate kid, who despite being independent, every once in a while comes back to the parents house asking for some advice6. This actually happened. Adams was having a hard time with the (quasi) French war, so Washington invited him over to Mount Vernon to “have a talk”. Washington’s intentions were soon noticed (and approved) by Adams. If there was a war, he wanted to be the Commander of the forces. Not only that, he also wanted Hamilton to be the second in command. Sounds like the dream team is back right!? Well not exactly, the war never happened, but the mere thought of it, created a lot of tension between Republicans and Federalists once again. Some of this tension had to do with allegiance. There was doubt of whether the Republicans would be loyal soldiers, since “the pope” and “the archbishop” of the Federalists were commanding the army. And another thing, Adams (the president) opposed to Hamilton being the second in command, not only because he didn’t like Hamilton very much, but also because he thought other people had better rank. Either way, the tensions died off, peace was negotiated, and the Army was never used—although Hamilton used this impulse to create a Military Academy.